Can they get away with this under reconciliation rules? I’d say no, since it doesn’t have a direct effect on government spending or outlays. But I assume they already ran this by the parliamentarian, and she approved it. 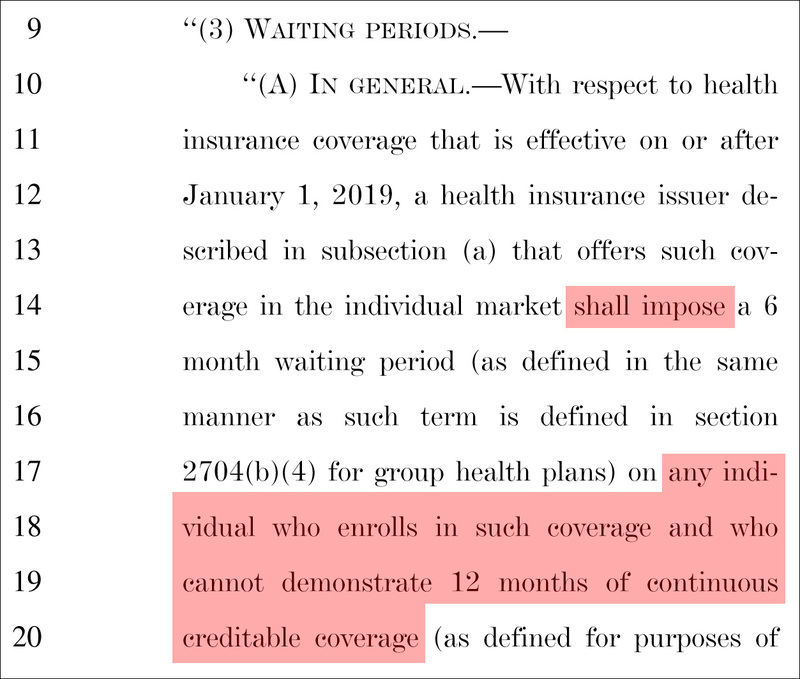 So that’s that: if you don’t maintain continuous coverage, you have to wait six months before you can buy insurance. There’s nothing inherently wrong with this. It’s a way of coaxing people into buying health insurance, just like the individual mandate penalties in Obamacare. But I wonder what the point is? Obamacare already restricts new signups to an open enrollment period at the beginning of each year, so for most people there’s already a waiting period if they don’t have continuous coverage. That’s still around in the Senate bill, so I guess this is just a way of tightening things up. Everyone who lacks continuous coverage has a minimum 6-month waiting period, even if they sign up during open enrollment. However, there’s an exception! There is no waiting period for “a newborn who is enrolled in such coverage within 30 days of the date of birth.” All heart, these guys.